I got the boat out of storage and put it in the garage the other day. Today, it's raining and cold again. I put this guy on my computer wallpaper as a reminder to get the boat cleaned up and ready to go. It's fishing opener in a couple of weeks for Minnesota's inland ten thousand+ lakes. P.S. That's a Big Mantrap lake northern. Baron tried to lick him before he was released. Not a safe idea. :) I'll be back there next fall. 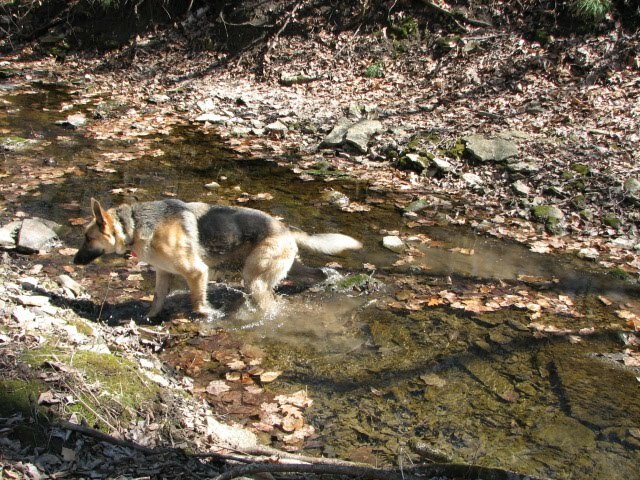 As a rookie birder, a couple of spring ago, I was heading to the old iron mine ponds for a hike with my GSD. On the way, I had noticed a "Minimum Maintenance" road I had not driven down for years. It was very narrow, dark, and heavily wooded. A hawk flushed out in front of me and landed several hundred yards down the road on an overhanging branch. I edged ahead. The bird never moved. I stopped and put the binocs on him. At this point, I must interject a note that in my new birding hobby I was I only confident in identifying the ubiquitous red-tail and the northern Harrier. Harriers because of their penchant for twisting and turning low above the prairie. I knew right away it wasn't a red-tail. It seemed considerably smaller, I thought. 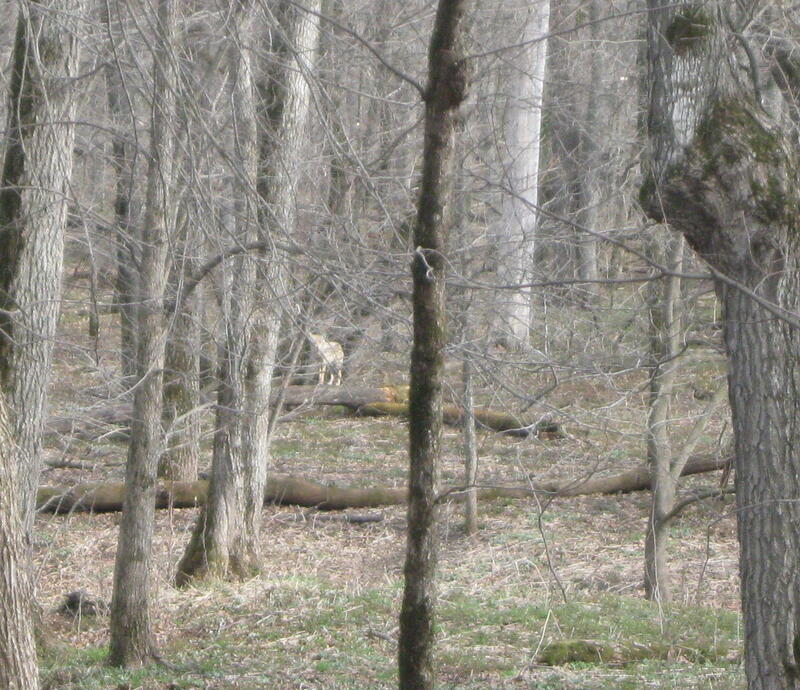 Then I noticed the white tail band. I moved the truck closer yet. Time for the Peterson field guide. There it was. 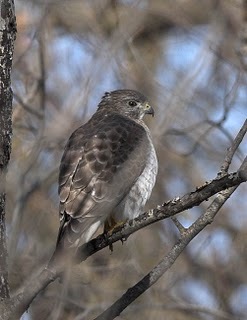 A Broad-Winged Hawk. "Forest hunter. Rather tame. White band on tail" my field guide claimed . Just to the south of us lies Decorah, Iowa. A small college town (Luther) with a Norweigian heritage and museum. 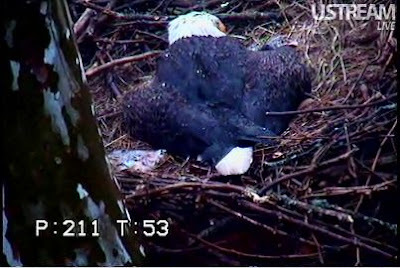 They also have a live webcam there, which has in the last few weeks had over 40 million hits. The big attraction. An eagle family doing its thing. Like many others, I've been mesmerized by watching it. Last week, I saw one of the parents (they take turns) pushing her little fuzz balls onto a cup of grass in the center of of the huge nest. The she/he settled slowly and carefully over them finally spreading her wings. What this all about I wondered. 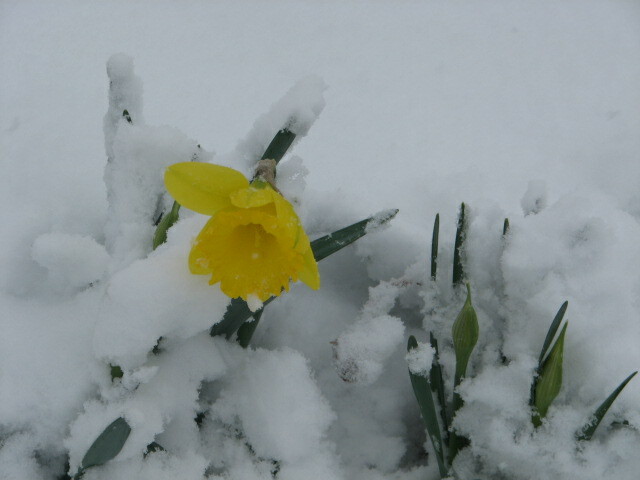 A few minutes later a strong wind came up followed by rain & sleet and finally snow. She knew.... and was ready. 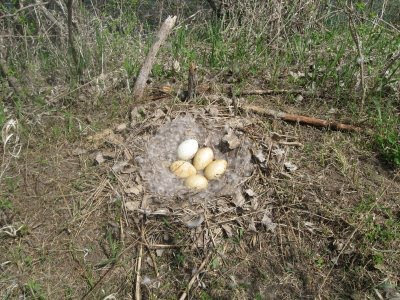 If haven't already seen the amazing eagle family of Decorah, Iowa..... check it out at the following link. Give it a few seconds to "load." 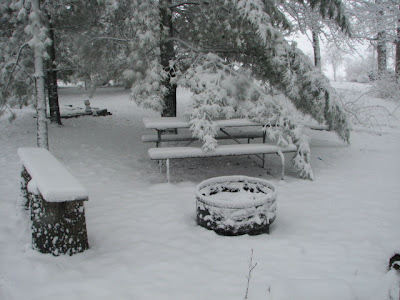 How about a snow picnic? Grrrrrrr. We went up. Then we went down. Then back up again. It was all for a spring wildflower and birding hike at Forestville State Park. It's unglaciated Bluff Country here, with hills and steep ravines, above the beautiful Root River Valley. It's also a favorite trout fishing destination for me but not today, as I'm carrying my point and shoot camera. I followed Baron up and down the trail. From the "fisherman's parking lot," we crossed the freshly burned prairie on the way to the hills and then began a long climb up to the south ridge. 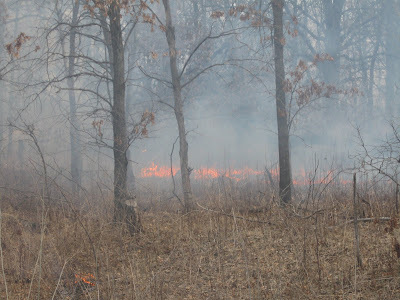 Our DNR burns prairie land in state parks, every couple of years, to rejuvenate things and keep them from being overrun by scrub trees. There was a spring & rivulet coming down the ravine and a foundation in the woods. It apparently was the remains of an old distillery, circa the Civil War era. 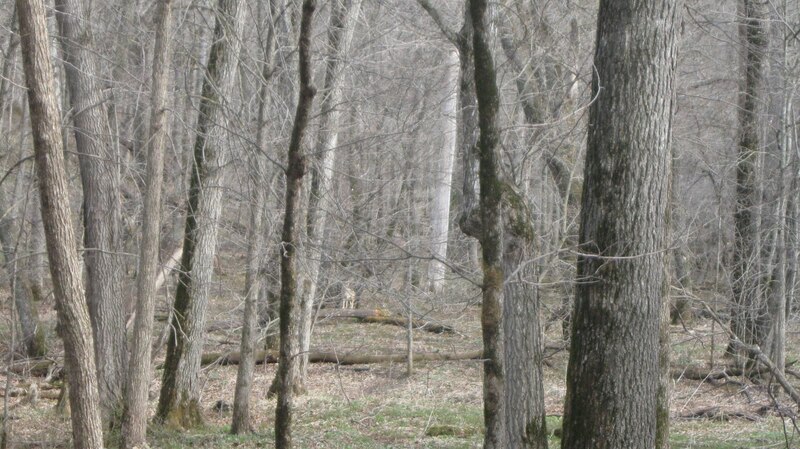 Ghosts in these woods, I believe. 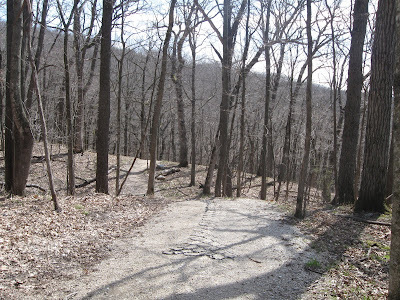 The long trail up the ravine leads eventually to the horse camp. 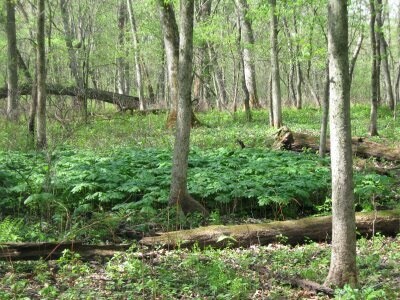 Not wishing to go there, I checked my map and turned east along a new trail to me called the "Fern Loop." 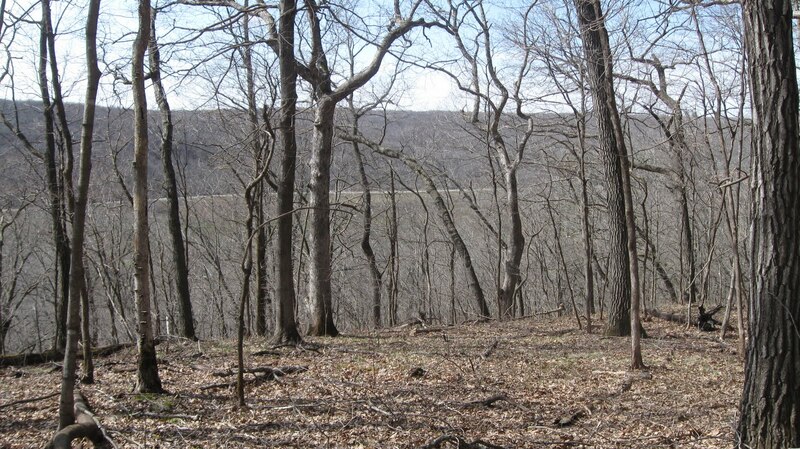 It inititally followed below an east/west ridgeline yet was still high above the valley floor. 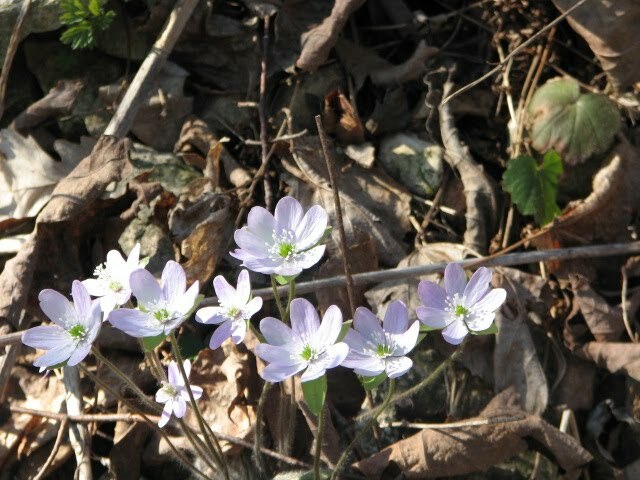 It just might be the place to see those first spring wildflowers..... Sure enough it was. 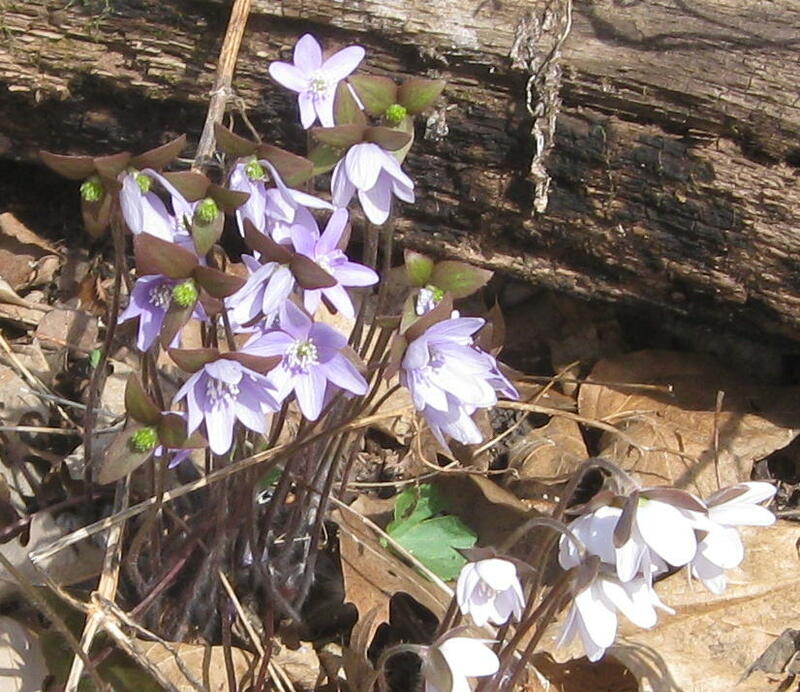 The hillside above and below me was covered with thousands of hepatica. 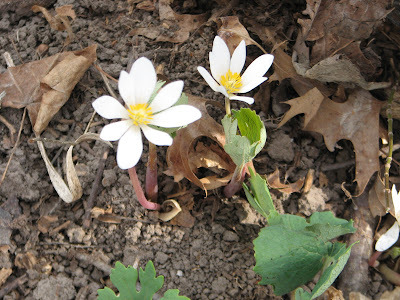 Searching for the first wildflowers of the year is one of the highlights of early spring. 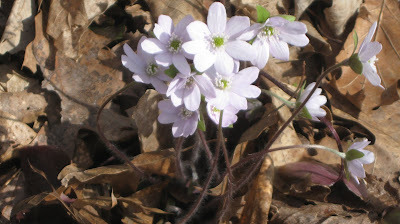 In eastern North America, one of the most delightful early blooming species is hepatica (Hepatica nobilis). 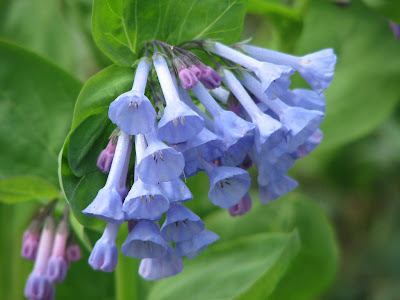 Its bright blue, white, or pink flowers warm the hearts of all who see them, as they shimmer in the rays of sunshine that reaches the forest floor thru the branches of the leafless trees of earliest springtime. The hillsides have many "seeps". Not exactly springs but where a trickle of water keeps the ground wet and soggy. 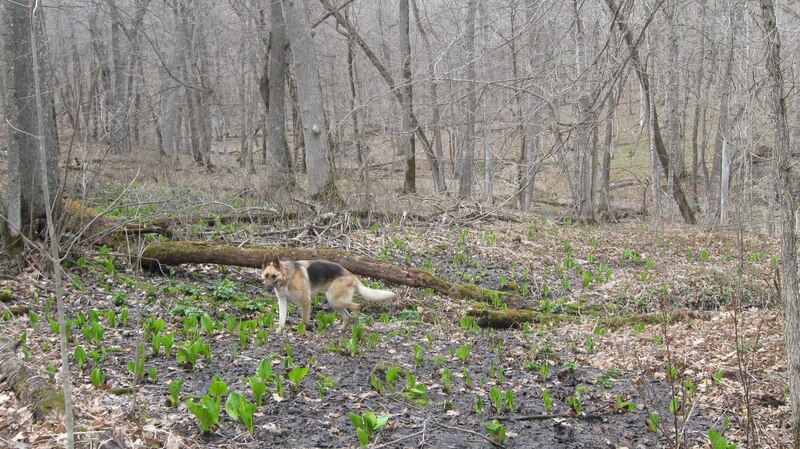 This is the favorite habitat of skunk cabbage and marsh marigolds. They are also early spring wildflowers. 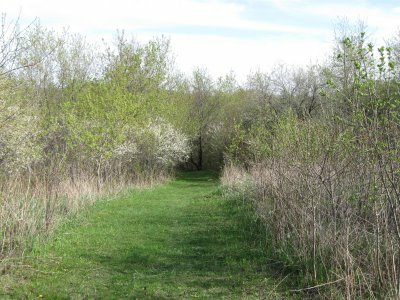 The woods is also coming alive with the spring migrants. I see lots of Hermit Thrushes, and few Ruby Crowned Kinglets and Eastern Phoebes. They all move too quickly and far away though for my point and shoot so I stick with photography the cooperative wildflowers. Baron seems to have learned though when my binoculars are up, its time to stop and wait for me to catch up. 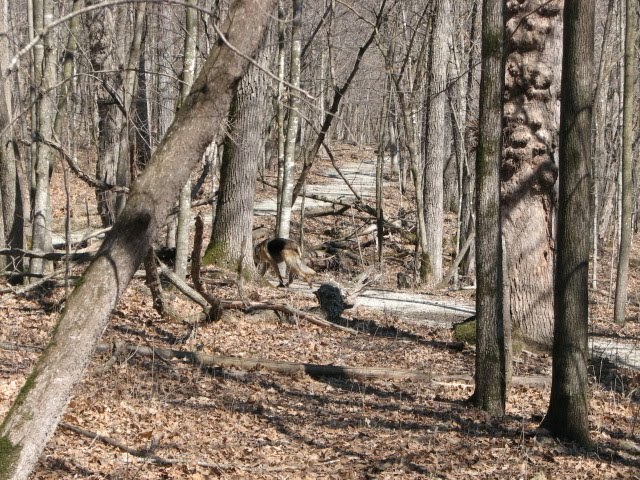 I'm always watching for movement in the woods. 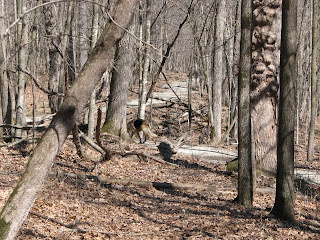 On one occasion, as we came down into a small creek bed, I caught some movement in a woodpile up ahead. Half hidden it peered intently at me as stared back. 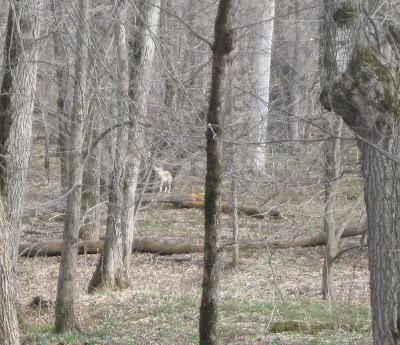 "That's one big coyote," was my first thought. 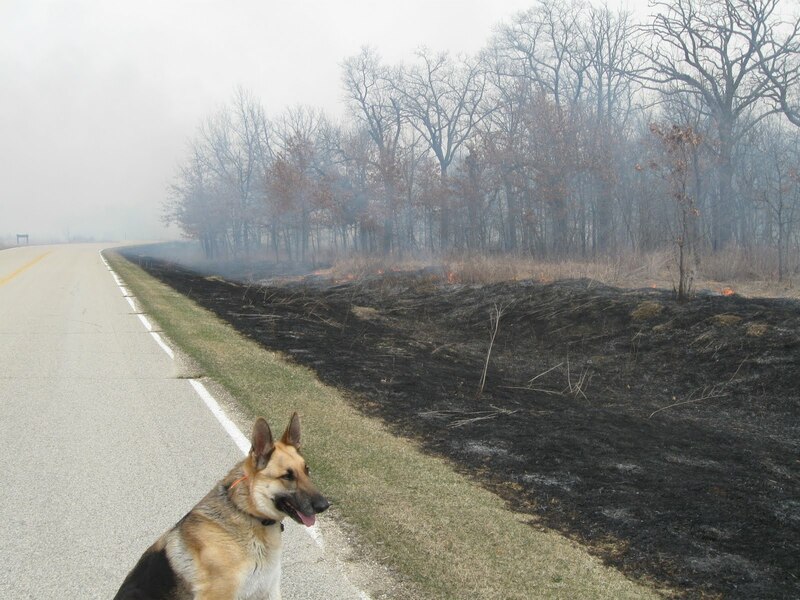 I've always been skeptical of most wolves being reported this far south in Minnesota. "Get your camera out dummy," & I did. 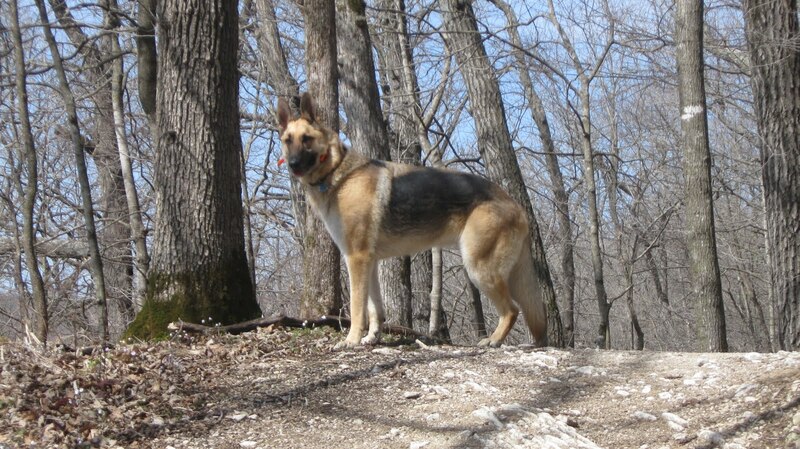 I motioned Baron to my side, not wanting him to chase anything so big and wary looking. At a loss for something intelligent to post this morning, I’m left with repeating an incoherent one from a couple of springs ago. Hang in there with me..... 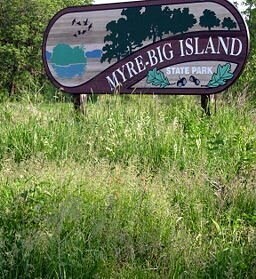 The Baron and I had done an overnighter at Myre-Big Island State Park. The purpose was to test Baron's ability to spend the night camping without causing a ruckus, in any way, that might disturb other campers. He passed with flying colors. 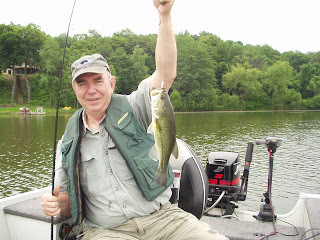 I had thought about going fishing on Albert Lea lake the next morning. No go. I forgot my fishing pole. 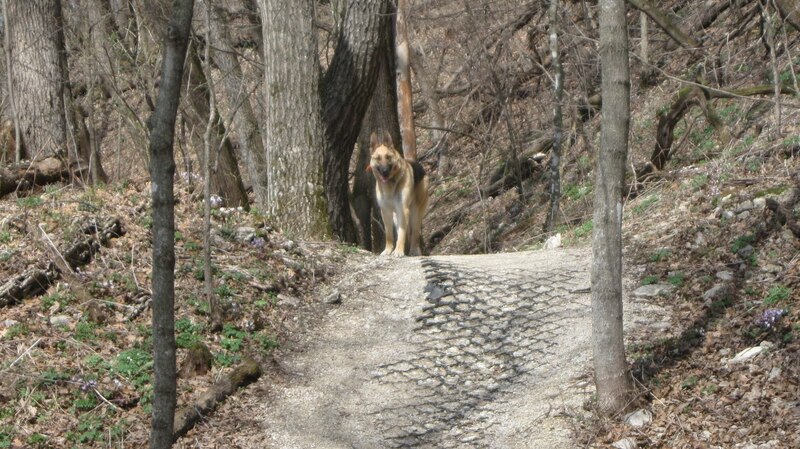 Instead Baron and I opted to hike the "Big Marsh Trail." In the spirit of Gary Larson the following report may be too gross or childish for some tastes - therefore it is rated SM - Silly Mature. It was early in the campground and very quiet. Baron strained at the leash ready to go. Things went well till he spotted a wandering squirrel. Dragging me down the road and barking at the same time was not a good beginning. Escaping the campground, I found the trail. It looked like we might be entering some sort of "black hole." 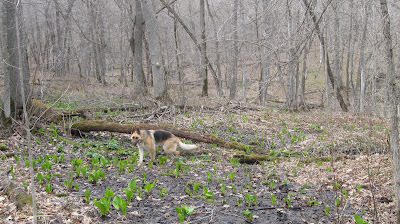 Shortly thereafter, we emerged from the deep woods to overlook the goal we had been seeking - the Great Marsh itself! Which brings me to the early development of my lifelong interest in great literature. In my youth, say at about 5th or 6th grade, young boys began sharing their interest in books by referring to such titles as "Under The Grandstand" by Seymour Butts. "How We Got To Bethlehem" by Don Keys, or "Yellow Rivers" by I.P. Daily. 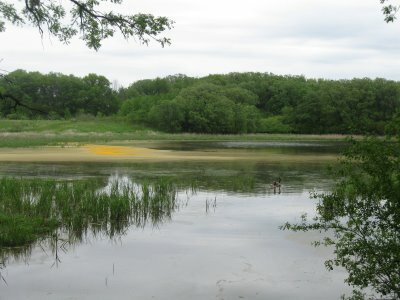 As I sat on the bench overlooking the swamp, and seeing some kind of yellow algae bloom on the water, I couldn't help but think of Mr. Daily’s famous book title. Sorry folks. Some mornings I just can't help myself. This is an up close and personal report on skunks. No. No Not that kind. The kind that is among the first plants to reach up to the sunlight in earliest spring. 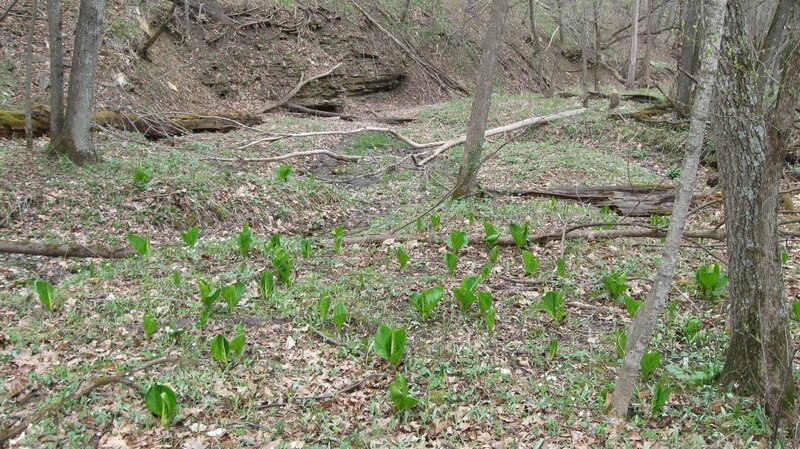 They're call skunk cabbages. 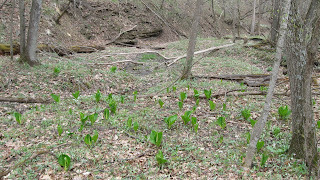 The troutbirder family had gone hiking up a small ravine in Forestville State Park to search for this oddly name plant. 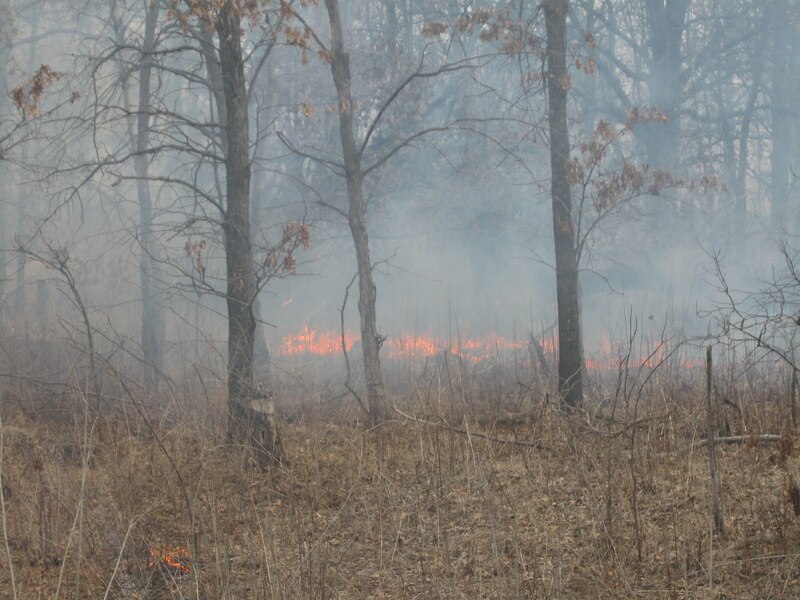 The woods had that bare gray look to it before the trees had begun to leaf out. The ground was leaf littered without much of anything growing yet. I was looking for some "seeps". That is a area that would be permanently wet thoughout the summer. 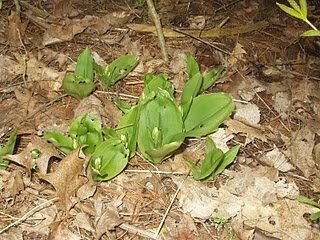 It might on a hillside or along a temporary streambed coursing with spring runoff. Baron as always led the way. There they were at the base of a small outcropping. When the skunk cabbage first pops up in the spring, it looks quite like something you've never seen before. 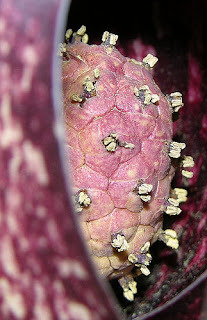 The "flower" is rather exotic as well...... and yes it does have a, shall we say, quite unique "aroma." 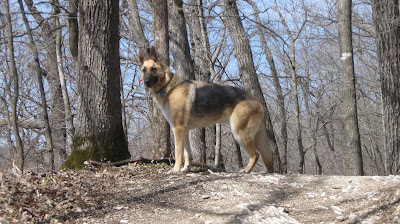 It's been a long hike this morning so Baron and I plunk down in the leaves for a breather. 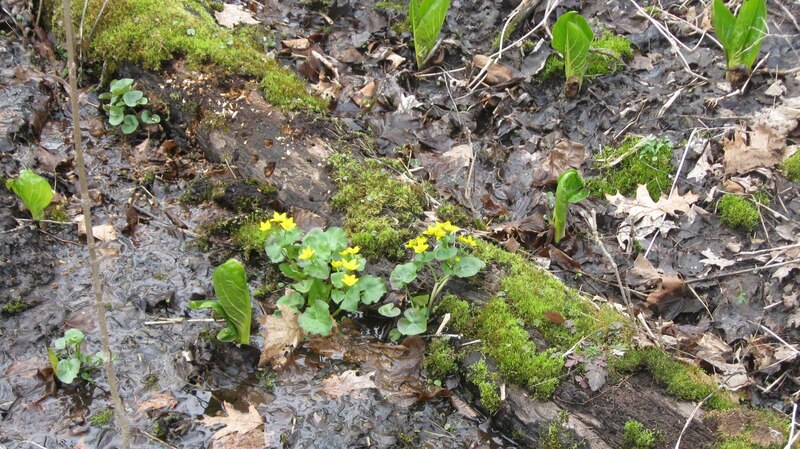 Our hunt successfull we know for sure now, that the skunk cabbages having arrived..... so has spring! Today, as I’ve noted being done in other blogs, I’m going to share some of my favorite game, fish and fowl recipes. 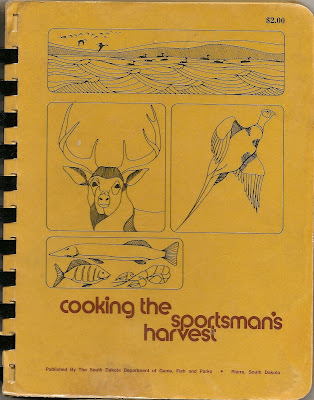 When first married my spouse purchased "Cooking The Sportsman’s Harvest" from the South Dakota Department of Game, Fish and Parks (Published in 1974) I hunted upland game and waterfowl in those days along with bow hunting deer. So with slight tongue in cheek, I present some of the top items to prepare mentioned in the book. 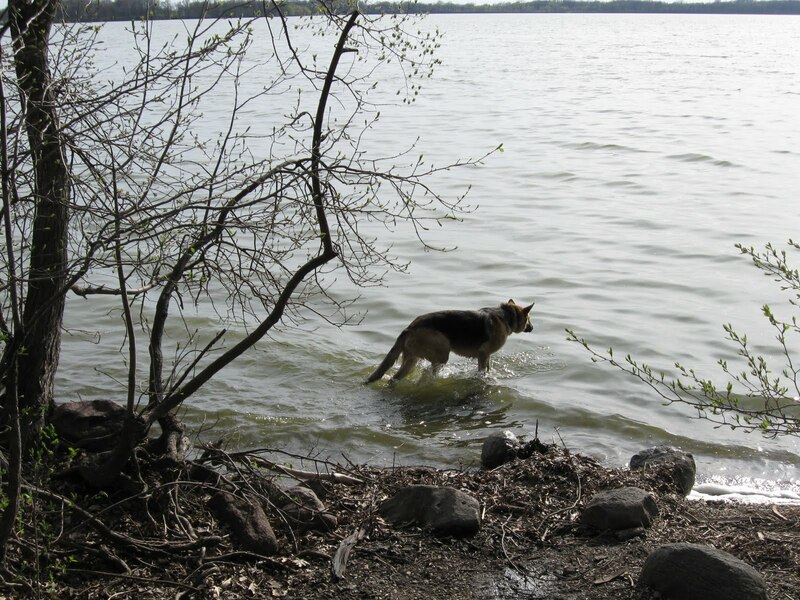 It will soon become obvious that in the Dakotas (both North and South) it is legal to shoot anything with four legs (including a table), flies or swims. Please note in the comment section those items of which you would like to see detailed recipes. I will gladly post them later. Let me know now. I'll provide the recipe. You provide the "fixins." We had met son Tony & grandson Ethan, from Colorado, to spend a few days camping in the Black Hills of South Dakota. They arrived on Saturday, so Barb and I having arrived in Custer on Thursday night, had a day to explore on our own. Naturally, I brought my binocs and so on Friday afternoon we found Lewis and Clark. 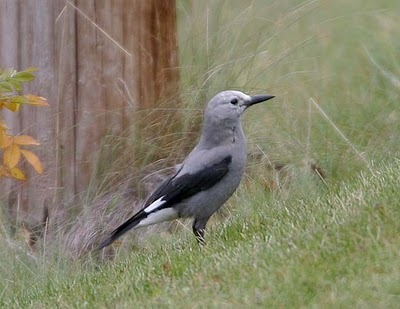 Lewis's Woodpecker and Clark's Nutcracker that is to say. Both are western birds especially associated with boreal forests. Ponderosa Pines in particular. I must say that having enjoyed telling the story of these two great pioneer explorers of the West, many times to my history students, it just seemed appropriate that the sighting of these two bird "lifers" just happened As the range map shows, the Black Hills are at the western extremity, of Lewis's Woodpecker's home territory. And thus we enter "The Rites of Spring." 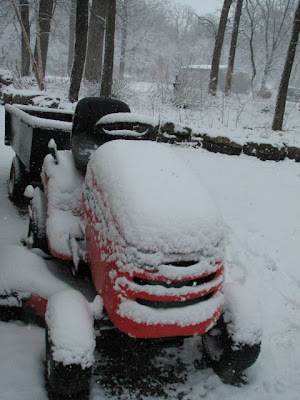 A time to clean up the yard and the flower beds. 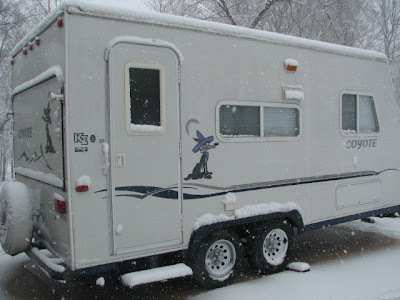 Check the boat and the camper. Clean out the garage, the shed and the vehicles. Get the bike down from overhead. 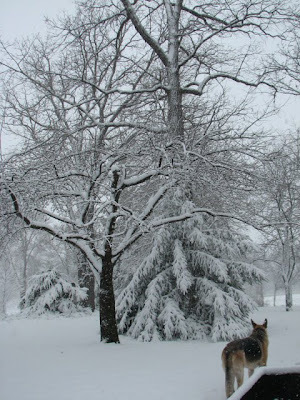 Then, as spring appears from the doldrums of March, I begin to think of "emergers." There are two that immediately catch my attention. The first are those tiny insects that spring from the waters of our crystaline limestone spring creeks. 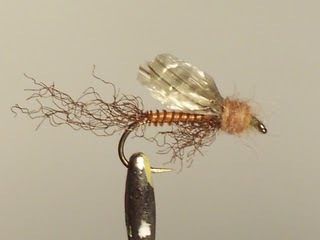 They are stone, caddis and mayflies. In the springtime, the moment when these tiny insects transform from their nymphal form and swim to the surface of the stream is indeed magic to the trout fisherman. As they struggle upwards, to flutter away, they are called emergers. 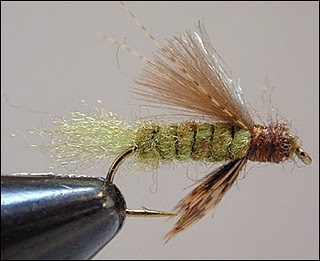 This is the time for "wet flies" to be cast into the stream and lifted in imitation of the real thing. It is what I am thinking of, in the winter season, as I tie my own imitations of them. 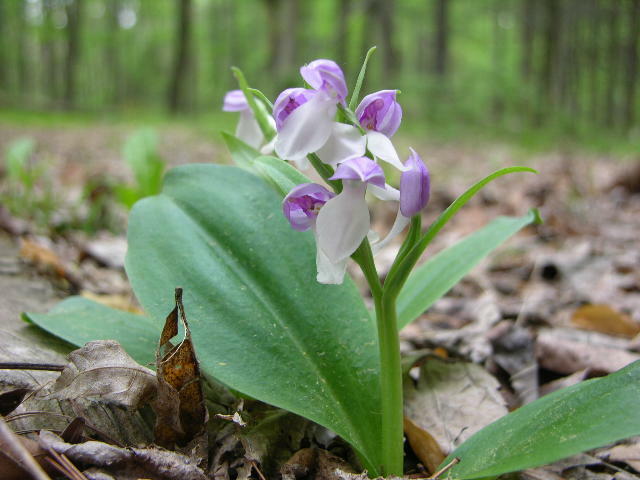 The Showy Orchis. A now rare native orchid of hardwood forests here in Minnesota. Thick basal leaves and small spurred flowers. The lip is white. Other petals and sepals are pink or magenta. About 6 inches tall. 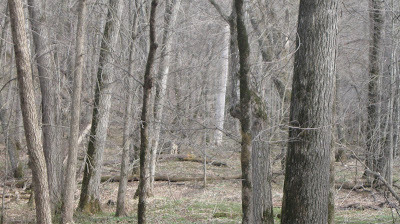 Photo taken in Forestville State Park 5/12/08. 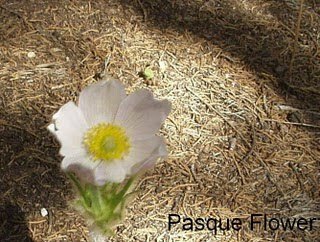 Appearing from the forest litter on a ridge high above the Whitewater Valley in Whitewater State Park is an early blooming native Pasque Flower. It is a rare member of the crocus family. 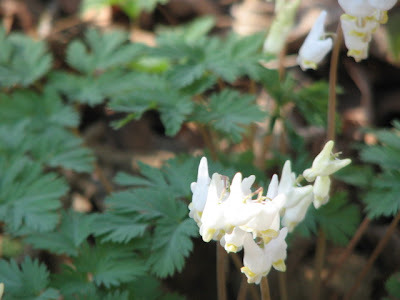 These and many other spring woodland flowers are considered "ephemerals" meaning they emerge and bloom quickly before the forest canopy shades them from the sunlight. Emergers. You gotta love them as we step out from our winter blahs as well.